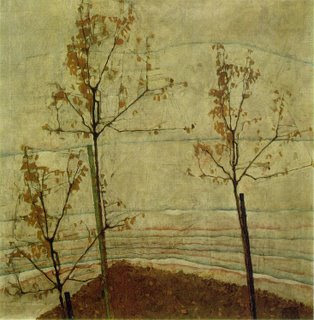 Echoing claims made for the show of landscapes by Gustav Klimt at the Osterreichische Galerie Belvedere, Vienna, the case for the survey of landscapes by Egon Schiele at the same city's Leopold Museum insists on the high proportion of the artist's output falling within this category and on earlier commentators' relative, and paradoxical, indifference to it. Both assertions prove better justified in the case of Schiele. Over sixty per cent of the paintings in Jane Kallir's Schiele catalogue raisonne of 1990/98 are defined as 'landscapes'; yet this contribution to the genre has only recently become the subject of a monograph--Kimberly A. Smith's wide-ranging study Between Ruin and Renewal: Egon Schiele's Landscapes--and is only now the focus of an exhibition. Although this is also the first show to be devoted to Schiele at the Leopold Museum, the private collection of Rudolf Leopold on which this institution is based has long been known for its extensive Schiele holdings. As underlined by the high proportion of items from that collection to be found within the current temporary display--eighteen out of fifty-one paintings on canvas, wood or cardboard and thirteen out of twenty-nine works on paper--varieties of landscape constitute one of its great strengths, with the most outstanding pictures clearly able to hold their own with its major figure paintings by Schiele, such as Hermits of 1912, the large allegorical self-portrait with Klimt. 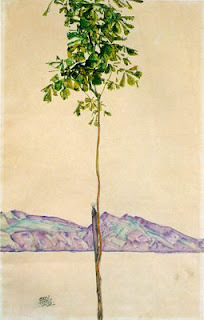 Leopold has, of course, done rather more than 'merely' acquire a good many Schiele landscapes. Of around fifty works newly identified in the catalogue of paintings incorporated within his Schiele monograph of 1972 (not included, that is to say, in the 1930 and 1966 catalogues published by Otto Kallir-Nirenstein) most are classifiable as landscapes, notably of the early years (1906-10). That monograph may also be said to have pioneered the topographical approach to the study of Schiele's many paintings of his mother's birthplace, the small southern Bohemian town of Krumau (now Cesky Krumlov, Czech Republic). And the fruits of this research are now made more vividly accessible to a new generation through the design and layout of the opening section of the exhibition, which seems in part to reflect the clearer topographical exposition of Franz Wischin's 1994 volume on Schiele and Krumau. The conclusions reached in 1972 regarding Schiele's other landscapes, notably his remarkable trees, gathered in the second section of the show, are likewise assumed to have stood the test of time, being restated, sometimes word for word, in the relevant entries in the catalogue. One of the earliest forerunners of Rudolf Leopold as a keen collector of landscapes by Schiele--the Viennese critic Arthur Roessler, who served as the artist's early champion, tireless mentor, informal 'agent' and influential biographer (the relationship was recently the subject of a path-breaking exhibition at the Wien Museum)--was also one of the first to explain his attraction to this aspect of the oeuvre. Roessler's misgivings about Schiele as a figure painter partially adumbrate those often implicit in the now familiar observations of scholars on the self-consciously 'performative', rather than directly revelatory, character of so many of the figural works. Reviewing the Schiele exhibition held at the Galerie Arnot in the winter of 1914-15, Roessler wrote that 'landscapes such as the one entitled Setting sun' (a complex, lyrical 'treescape', acquired by him in 1913 and sold on to Leopold forty years later) 'and some of the pictures of "old towns" evince such purity and tenderness of emotion and are so melodious in their appeal that one readily prefers them to the ecstatic figural images, which seem to have issued from the painful shuddering of a soul racked by convulsions.' And it was, he implied, precisely because the landscape subjects were essentially 'found', rather than 'staged', that Schiele was able to reveal more of himself through them. In the largely thematic grouping of the current display (which also informs the internal arrangement of section three, reserved for works on paper) it is as much the reiteration as the development of the favoured motifs that hints at their depth of meaning for Schiele. Autumn tree in turbulent air of 1912, reproduced on the previous page, mediates between the earlier single subjects--the gaunt Sunflower of 1909-10 or the 'dancing' Small tree in late Autumn of 1911--and the subsequent group compositions that culminate in the Four trees of 1917, stiffly aligned against a striated reddish sky. As has frequently been remarked, the picture of 1912 tends to strike the modernist eye as almost 'abstract', and then to suggest an allegory of spiritual torment. But it is informed, if not entirely explained, by a blend of alert observation and affectionate regard for popular tradition. The flailing branches seem at first as if torn free on account of the quasi-invisibility of a trunk coated in lime; the bright patches around several of the few remaining leaves acknowledge the phenomenon known in meteorological lore as a sign of imminent snow and the undulations of the dark ribbon of distant hills is easily read as code for the environs of Vienna. 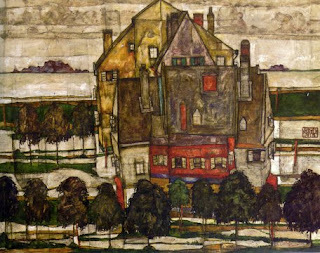 The 1915 painting of Krumau, by contrast, represents one of the last stages in Schiele's evolving response to this locality, which the exhibition traces from the haunting, nocturnal 'snapshots' of the shabbily venerable facade of its town hall and the first bird's-eye views of the huddled dwellings of the 'Town on the Blue River' series (all of 1910-11) to the more expansive vistas with stately rows of buildings fronting the Moldau (1912-14). Compositionally exuberant and chromatically exquisite, the three 'Crescent of Houses' paintings, above all that illustrated here, are an affirmation of Schiele's vision of the urban reconciled with the rural, of the man-made as a manifestation of the organic. 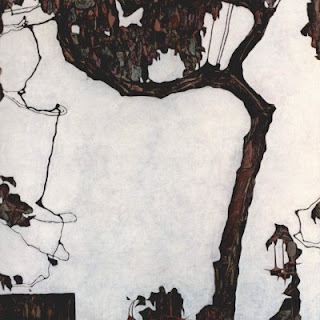 More specifically (as argued by Smith in the strongest chapter of her volume), the mottled, wayward roofs and walls of this concentrate of Krumau attest to Schiele's faith in what he and many Austro-German contemporaries identified as its enduringly 'Gothic' character. Well it makes a change from arguing how much he owes to Klimt anyway. about your article on AOL? I require a specialist in this area to resolve my problem. I think the admin of this web page is genuinely working hard for his website, since here every stuff is quality based information. I am going to be careful for brussels. I'll be grateful in the event you continue this in future. Numerous people shall be benefited out of your writing. Cheers! Thanks for one's marvelous posting! I actually enjoyed reading it, you are a great author.I will make sure to bookmark your blog and may come back at some point. I want to encourage you to ultimately continue your great job, have a nice weekend! work? I've absolutely no knowledge of programming however I had been hoping to start my own blog soon. Anyways, if you have any recommendations or techniques for new blog owners please share. I know this is off subject nevertheless I simply wanted to ask. Thanks! to…HaHa). You definitely put a new spin on a topic that has been discussed for many years. Hamburger Kunsthalle presents Mark Rothko.